The Fall 2018 Beacon Pointe Leadership Summit was hosted in Newport Beach, CA on September 23- 25th, 2018. The purpose of this meeting is to gather together all firm partners and many directors from various departments to discuss the firm’s strategic plans and the proper course to successfully execute and implement those plans. Throughout the 3-day leadership meeting, more than 15 formal presentations were given focused on a vast range of topical content ranging from strategic planning, technological enhancements, marketing and branding, financial planning, macro and micro market updates and investment opportunities, to talent retention and growth strategies, among many others. In addition to the critical and strategic thinking, the Beacon Pointe team had a little fun along the way! 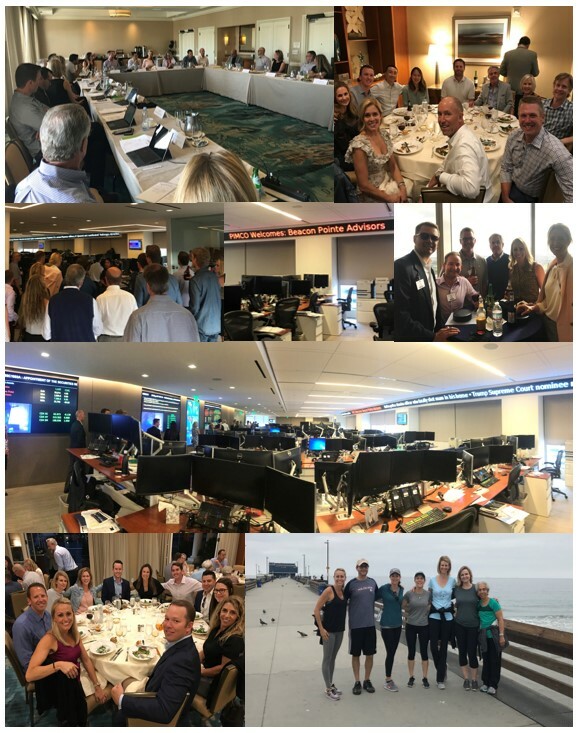 Each morning Beacon Pointe team members woke up with the sun to enjoy some fresh air and exercise along the beautiful Southern California Newport Beach coastline, and PIMCO graciously hosted the Beacon Pointe leadership team on a tour throughout their trading floor. The future is bright for Beacon Pointe – for our team, for our clients. We are excited for what is in store for the next decade!